These mexican inspired veggie burgers are a pretty great excuse to have a lot of cotija. I could have easily eaten the entire block but decided to exercise a little bit of self control this time. Avocado hasn't been high on my list of toppings until recently, and it's absolutely perfect for this burger. When you're making them, I would lean on the smaller side of patties. We made one of ours larger than needed for the sake of photos but they do fall apart much easier at that size. The burgers are spicy, full of flavor from the roasted corn, and should definitely be served with tortilla chips and a beer. Over medium-high heat, heat 1 tbs oil and sauté mushrooms and onions until well browned. Deglaze skillet with beer, making sure to scrape up any brown bits. Remove from heat and set aside. In a food processor, combine half of black beans, onions and mushrooms and pulse into the constancy of a rough paste. In a mixing bowl, combine remaining beans, faro, corn, processed beans, cumin, cayenne, garlic powder, and salt and pepper. Mix thoroughly and set aside. Can be made ahead and chilled. Just before forming patties, add panko breadcrumbs to mixture. Heat 1 tbs oil in a skillet over medium-high heat. Form 4 patties and cook them two at a time, for approximately 3 minutes per side, making sure a brown crust forms. Rest burgers 5 minutes. While resting, split bun and combine mayonnaise with chipotle powder. 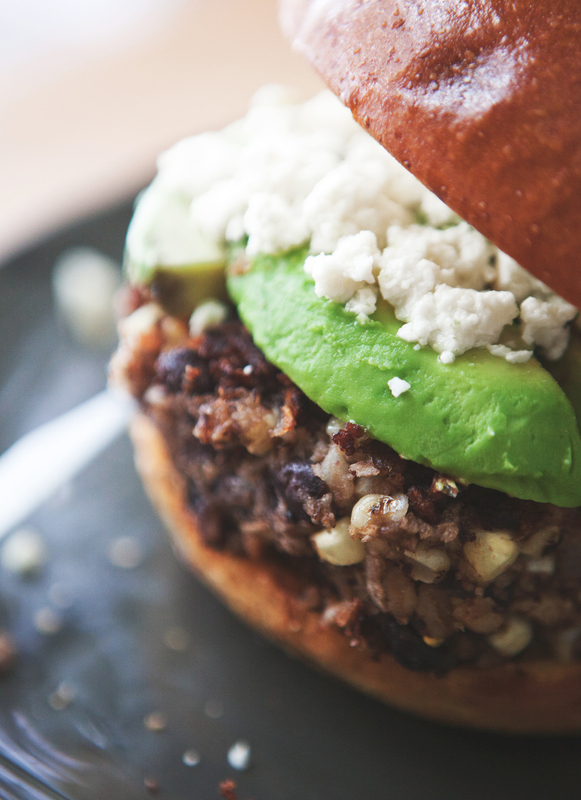 Spread on both sides of bun and assemble burger with avocado slices and cotija cheese.